The guys brought a lot of their money to Japan in Canadian traveler’s cheques. After a week of adventure, they needed to get more cash. After breakfast we went to a nearby bank in Noborito with an English sign stating that they exchange traveler’s cheques. However, when we went into the bank, they explained that they would not accept Canadian traveler’s cheques without the original purchase agreement. They also would not exchange Canadian cash into Japanese yen. We realized that we would need to find a bigger bank, so we went to Shinjuku where we easily exchanged the money and got service in English. Flush with cash, we headed off to Asakusa to see Senso-ji temple, the oldest and most famous Buddhist temple in Tokyo. 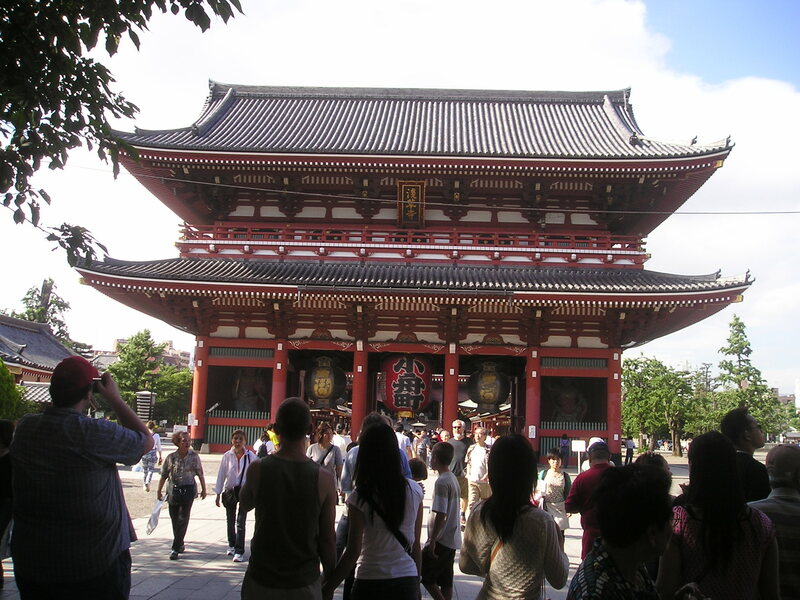 Senso-ji was originally founded in 628 AD and has gone through many upgrades and changes over the years. During World War II it was destroyed in the American air raids. After the war the temple was rebuilt as a symbol of rebirth. The temple is famous for its large gates and lanterns, but for me and my friends the highlight was Nakamise – the 250 meters of stores leading from the gate to the temple. Nakamise is one of the best places to shop for souvenirs. We navigated the crowds and everyone bought some proper souvenirs to take home. Code Red wanted to bring back a sword, but we weren’t sure if it would be confiscated by customs or not. After much discussion, he decided not to take the risk. 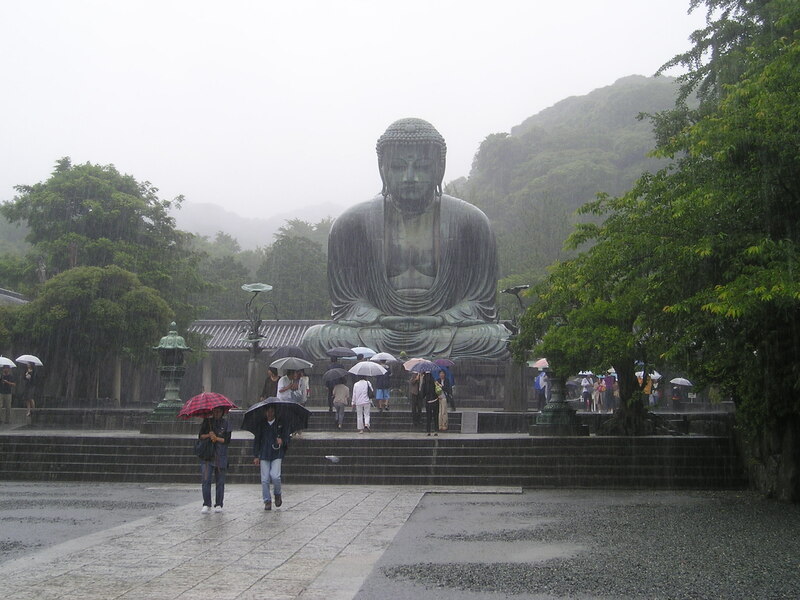 At the temple, I played tour guide, repeating information that I had learned on my travels with The Penpal. I explained how to wave the incense smoke to cleanse yourself before going into the temple. I also explained omikuji – the small paper fortunes that you can buy outside most temples and shrines. 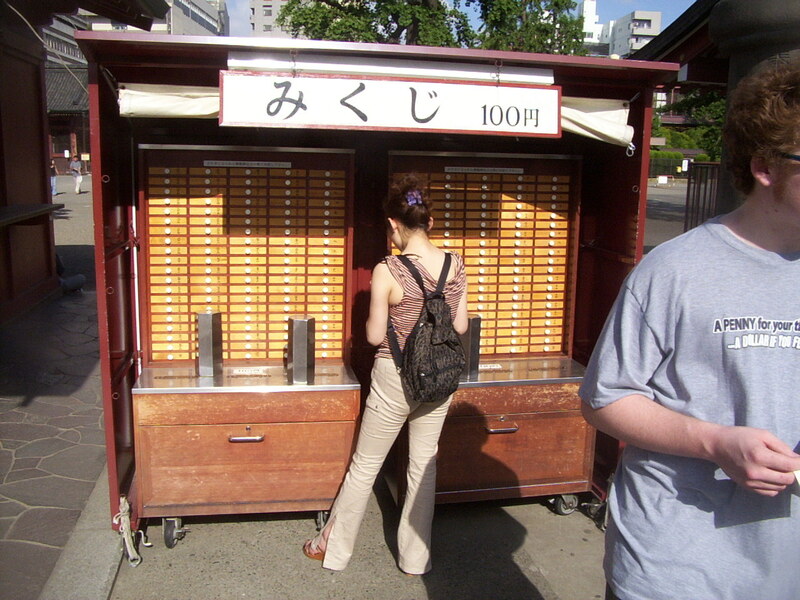 To get your fortune at Senso-ji you pay 100 yen, and then pick up and shake a large metal box filled with sticks. This makes an impressive noise. Eventually one of the sticks will pop out the hole in the top. The stick will have a number written on it – usually in kanji. You then open the drawer with the matching number and take your fortune. The fortunes will range from excellent to terrible, giving detail on finances, romance, work, etc. If you get a good fortune you can keep it, but a bad fortune should be folded up and tied to a nearby stand. That way you can leave your bad luck behind. Green got the worst possible fortune, but instead of leaving it behind, he insisted on bringing it with him as a souvenir. For the rest of the day Flounder, Code Red, and Hippie debated whether or not they wanted to get on a flight back to Canada with Green if he kept his terrible fortune. Senso-ji is a must visit if you are in Tokyo. Wear comfortable shoes and be prepared for crowds, and bring a camera because everything is worthy of a picture. (2014 Update) Does anyone still use traveler’s cheques? Those things are the worst.